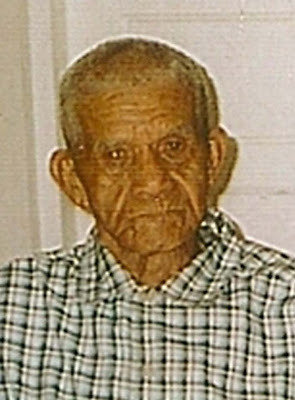 THE OLDEST MAN LIVING TODAY IN CROOKED TREE VILLAGE AND POSSIBLY BELIZE was born in the final moments of 1904, as roosters in Revenge Mahogany and Logwood Works were crowing in the New Year. Mary Jones Rhaburn gave birth to her fifth child, and third son, the one chosen to bear his father’s name – James Rhaburn – on December 31, 1904. In those days, the itinerant ministers (pastors) traveled circuits to attend the needs of the members of their congregation in their homes. It wasn’t until late in 1911 that one such minister visited the Rhaburn family in Revenge and had a mass christening service. On the 17th November, 1911 James, by then just short of his seventh birthday, was christened along with two younger siblings – Iris (3 years) and Mary (6 months) – and four cousins, namely Ada for his Uncle Jonathan Rhaburn who was born in February 1902 and Alberta (3 years), Benjamin (17 months) and Isaac (11 weeks) for his Uncle Elijah. He grew up as the youngest son of his parents and big brother to four younger sisters. With a total of nine children in this family, James, the middle child, never lacked for company or for chores. Since the family earned their living from harvesting mahogany, it often fell to the younger children to assist their mother while the older men and boys were out camping during the logging season. By the time his father died on 1 February, 1921 in a logging accident, twenty-six year old Nathaniel (Uriah) and eighteen year old John had already left home and started their own lives, so James became the man of his mother’s house at sixteen. His older sisters Emma and Estelle were also already gone, so he was the only one left to help his mother care and provide for the four younger girls – Iris, Mary, Lucille and Adora (who was only three years old when she lost her father). James worked hard to help his family. After his father’s demise he went ‘to bush’ with John, his brother, to harvest chicle as a way to help bolster the family income. He said when he first started he was still such a softy, he had to wrap his legs in burlap (crocus bags) to ease the scraping, banging and bruising they were constantly being subjected to while working. At some point during his early years, most of the Rhaburns, except old Elijah, left the 24,000 acre family estate called Revenge Works and settled on property they owned in Crooked Tree. The property in Crooked Tree was referred to by Samuel Rhaburn, James’ uncle, in his will dated 7th May, 1890. He left both Revenge Works and Crooked Tree Works to his brothers, sisters, children and wife ‘as tenants-in-common’. Being the eldest son of James’ grandfather, Samuel and his mother, Emma Elizabeth Alexander Rhaburn, had become the administrators of the estate in 1885 after the death of John Augustus Rhaburn, on 27th November, 1884. James was not alone in his struggles to fill the gap left by his father’s death. His mother was a resourceful, skilled and well respected woman. She was a midwife and healer. James recalls with pride how many in the village depended on her to heal their ills and attend their child birth beds. He can still clearly recall the day a man in the village was severely injured in a horse racing mishap when his horse galloped under a low hanging tree branch. Ms. Mary worked very hard to set his broken bones and patch him up for the long journey to Belize by dorey. When he finally arrived at the doctor’s office more than a day after he incident, the doctor reportedly told those who had brought him that there was very little to be done that had not already been done for him. Basically, all that was required after Ms. Mary’s treatment was time to heal and probably something for the pain. In his early years James fathered two children by Daisy Wade. Ionie is his eldest child. His son Mervin migrated to Guatemala at an early age and it is uncertain what has become of him. James often wonders about Mervin and he is mentioned in many conversations. It is his fondest wish to find out what became of his first born son. In time James met Winifred Usher there in his village. Together they raised nine children – Evan, Norma, Wincy, Bernice, Elswith, James, Genevieve, Maridell, and Faye. They were hardworking, dedicated parents who instilled the discipline and good moral values necessary in their children to enabled them to become the well-rounded citizens they are today. James and Winifred remained together until 24 July, 1987 when Winifred succumbed to injuries she sustained during the robbery of their little shop in Crooked Tree. In his lifetime James did many different things to provide for himself and his family. He happily relates stories of camping out for long periods logging, harvesting chicle, or farming. A smile still lingers on his face when he speaks of the many hunting trips he took to bring game home to share with family and friends. It makes him happy to remember the many fish he caught while striking at night on the lagoon. He also enjoys talking about those who were talented musicians and of some of the fun sporting events they had in his days. He was appointed as a Justice of the Peace in September 1969 and has faithfully served his community in that capacity since his appointment. Except for visiting his children in the United States of America, James has lived his whole adult life in Crooked Tree and until he was over a hundred years old, he could be found living alone in his little wooden house on stilts behind the ball field. He spent many hours sitting under that little house chatting with people, relaxing and reading. It was amazing how agile he was with his walking stick as he negotiated his way up and down those unstable-looking stairs with a big smile on his face as he welcomed his visitors, or ascended them to get something from upstairs. Yet as fate would have it, it wasn’t until he moved into the new house (a bungalow), that he fell and broke his hip; which lead to his immobility. Thankfully, his children and community have been faithful, caring and supportive of him in his old age and infirmity, so he is well tended and visited by many. To this day Uncle James, as we call him, is still a smiling cheerful person. His memory, hearing and eyesight are still very much intact and, until recently he was an avid reader. Being bedridden has not soured him and it is a pleasure talking to him. He once told his grandchildren he would live to a hundred and eight years old and they are hoping he will; but he appears to be tiring now. When asked recently about his hundred and sixth birthday, he said, “That is a tall order. You know how long a whole year is?” In responding a comment about telling us the secret to his long life, Uncle James said he feels God has blessed him greatly and he thinks it may have something to do with the fact that he always tried to be kind and fair to those around him. He said as long as he had what someone needed, he would give to them. That was when he smiled to recall the dozens of fish given to the women of the village after a night of striking and the lovely chunks of venison shared with friends and family. He said he had no problem in giving; because he knew they needed and he could always go out and get more for himself when the need arose. Whether Uncle James lives to see another birthday or not is not more important than the fact that he has already lived a longer and healthier life than most, having survived all his siblings, except the youngest, ninety-two-year-old Adora Rhaburn, who lives in New York. He has lived a full and productive life that has earned him the respect of his community and the love of his family. In living all these years, he has gathered a large storehouse of knowledge we would be wise to gather from. Even more amazingly, God has blessed him and us by allowing him to have excellent recollection and a cheerful, friendly disposition even at this advanced age. I personally feel honoured as his grandniece (his sister Lucille’s granddaughter) to have been privileged to know and spend time with him, sharing in his memories and stories of a time and people long past. 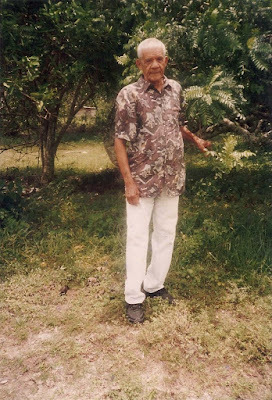 James Alexander Nehemiah Rhaburn is a living testament to one hundred and five years of our family, his community and Belize’s history and he should be honoured as such. Note: This article was written by Ruth McCulloch Neal in honour of her granduncle, James N. A. Rhaburn, following the occasion of his one hundred and fifth birthdays at the request of Linda Crawford Elul for publication on her Crooked Tree Village Blog. Ruth has an abiding interest in Belize’s genealogy and family history and is in the process of compiling her extended family tree on which she hopes to include stories and pictures of our families, both past and present. This tree already includes information on many families throughout Belize including: Adolphus, Bedran, Bennett, Betancourt, Burn(s), Cadle, Crawford, Dawson, Flowers, Gillett, Jones, McCulloch, Meggs, Neal, Reyes, Rhaburn, Sutherland, Swasey, Tillett, Vernon, Wade, Waight, Westby and many others. She hopes this project will help to create a sense of self in us as Belizeans (especially the younger generations) to help anchor us as a people and she hopes it will become a gift for our future generations. If you wish to contact Ruth directly, write to her by email at teemac254@yahoo.com. This is really interesting and good reading. Thanks Ruth for putting so much of your time and energy into this story. All I hope for since I have some of the Rhaburn genes in me that I can live a long and healthy life. Thanks Linda for getting a very good article on your blog and for sharing it with the world. Good luck to you Ruth with all of your history searching. May you find more information on your search. All I can say is good digging into our past. This is really a good insight for our future generation. Great job as usual Linda.. Keep it up.. take good care.. It's a great and informative post - great job you're doing. I am Keishalyn Estell, daughter of Elswith Rhaburn Estell, and I too just wanted to say thanks for the article. 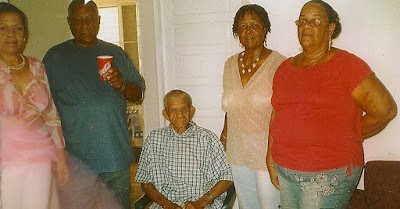 Grampa is my love and I too look forward for his 108th Bday as he promised my sister Sue. Keishalyn, as you know by now, I agree with you about your grampa, who is my Uncle James. He is so very special and I'm happy Linda provided us with this forum to share him with others. Now all we have to do is make the most of the gift of time God has given us in him. Thank you Ruth and all my visitors for your support. I hope I can continue to add relevant news about our community. This is wonderful! I had always heard interesting stories about "Grandad James" from my very good friend Sue. I hope his family spend quality time with him as much as possible. This is good work, keep it up! This is great; the whole thing, the blog, the stories, the Crooked Tree fan site. I am a Cultural Anthropologist who lived in Crooked Tree between 1993-1995, and have been working on putting together some of the history of Crooked Tree...I collected a LOT of family trees during that time, and also spent quite a bit of time in the National Archives. I am very slowly working on getting some of my writing on Crooked Tree, and rural creole (when I spend time in Belize now, it is in Lemonal with my husband and his family) villages in this area of Belize. If anyone would be interested in reading, commenting on any of this, please let me know. I have a very deep love for Crooked Tree and Lemonal. Today it saddens my heart to write that the sweet smiling grampa is no longer with us. He passed away on March 21 a Sunday at 7am. He was laid to rest on March 26th in his home Village of Crooked Tree. Gramps I love you and I miss you everyday more and more! !